More than 400 children are expected to attend the egg hunt April 21 at the Trans-Allegheny asylum. 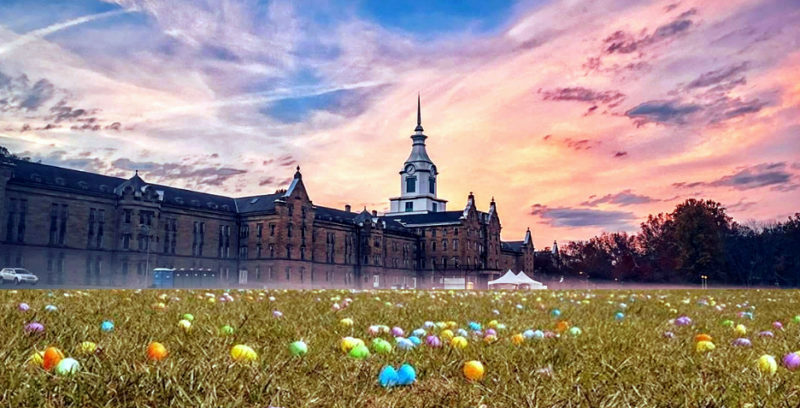 The Easter Bunny will work overtime Sunday morning in Weston hiding more than 12,000 eggs on the lawn of the Trans-Allegheny Lunatic Asylum, a museum and tourist attraction that’s gained national notoriety as a classroom for the history of U.S. healthcare. More than 400 children from six states are expected to attend the 12th annual Easter-egg hunt April 21, according to Gwendolyn Harman, a spokesperson for the asylum who says the event fulfills an important social function. Established as a psychiatric hospital before the U.S. Civil War, the asylum became a flagship for pioneering psychiatric treatments but closed in the 1990s when a new modern facility opened nearby. It famously includes a massive central building of more than nine acres that was designed to admit sunlight and fresh air to aide in the restoration and sustenance of the health of residents. Overlooking the West Fork on the Monongahela River, the museum last year welcomed more than 27,000 guests during history tours and thousands more during special events and during popular paranormal tours. Participants in the egg hunt will be eligible for more than $1,000 in prizes. This event is free and open to children 10 and younger. Registration begins at noon and the egg hunt begins promptly at 1 p.m. Harman said the rabbit will take breaks from his busy schedule to meet children and pose for photos at noon. Find out more at the Trans-Allegheny Lunatic Asylum.